Social media a well known way to stay connected with world, in today time social media is very popular in teenagers for their social works and entertainment. Social media can play a major role in building a strong friend. 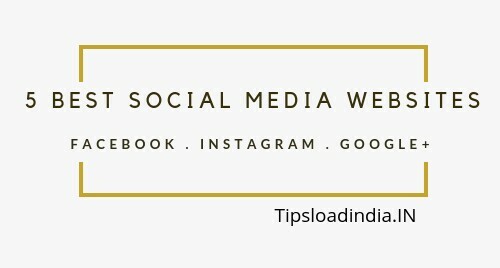 There are thousands of social media websites are available on level which can be used for free and some of them are very popular all over the world I think that you are also using two or three social media websites from them. If I'm right then your first priority in social media website is Facebook yes I am also using this website for my social messages. This is the no Singhal website which is popular along with this there are several social media websites are available. 5 best social media websites for daily use in our life. In this article I will describe five best social media website according to their rating and User experience. this is my personal experience With those websites. Facebook is world largest social media websites billions of user. The social media website is introduced in 2004 by Mark Zuckerberg along with his friends headquarter of this social media websites are situated in California America. This is the world largest social media networking website and now this website is active in several countries India is the biggest user of this social media website. • free for every one and a trusted platform. • you can create a friend circle with oneclick. • you can create a fan page on Facebook . • you can create the social media website to advertise your mobile application. • you can advertise on Facebook. • you can sell products online with Facebook. You can easily share your photos and videos on Instagram without any cost you can also follow your friends and celebrities on Instagram. The social media website is very famous in all over the world specially in India. You can share your story with your picture to your friends with the help of instagram. Twitter is a well known social media website which is mostly used by celebrities you can also use Twitter to follow your favourite celebrity. You can share your thoughts on Twitter and people can retweet your thoughts on Twitter with the social media website you can follow your favourite celebrities and stay connected with there latest profile update. Now today is not only social media website but this is also a good source of latest news and controversy. People make gossips and comments on their celebrities on Twitter. Pinterest is a social media website where you can upload your images and some videos with this social media website you can join a large group of 200 million active users this is the largest social media website which is used for Share images most of the big companies are taking service of the social media website to promote their products you can also upload your product images on this website after a little registration this website is founded by Ben and now this website has get Alexa rank of 76. With Pinterest you can got high quality visitors on your website without any cost. Google plus is a social media website which is powered by Google where anybody can share his thoughts and images without any cost this social media website have millions of active users which is a very large amount of visitors you can monetize your products on this website this is also available in application form which can be downloaded from Google Play Store without any cost this social media website provides you large communities and Groups enjoying any group and share your images in those groups. This is a very popular social media website in developed countries. The social media websites are very useful for some kind of works like if you want to promote your product online then these social media websites can help you to do this work this website will provide you high quality customers from large countries in large amount you can easily expand your business in several countries through the social media websites or if you want to start making friends then social media is the best platform to start this work you can easily find your friends on the social media websites. The social media websites can play a major role in relief in natural calamity in areas. Can easily start crowdfunding for relief works in Harsh areas of the world for humanity. But now most of the teenagers are using this website for their entertainment they upload their pictures images and several types of comments to get social reputation in the eyes of their friends. Social media can be used for better life standard, we can use social media to help people. Social media a great way to get attention of people toward those people who need help to survive. These social media website are very useful in our daily life.